Boston Red Sox slugger David Ortiz, a designated hitter in American League ballparks, played first base in St. Louis during the 2004 World Series. He'll do the same for Game 3 of the series Saturday. The all-tied World Series resumes tonight, with Game 3 between the St. Louis Cardinals and the Boston Red Sox. Ahead of the game Saturday, the main storyline centers on the change of venue to St. Louis, where the Red Sox, and their pitchers, will have to adapt to National League rules. "For the Cards, there's the obvious comfort of home: familiar surroundings, loving, red-clad fans certain to pack Busch Stadium. Then there's the advantage of no designated hitter, now that the series is in St. Louis, which potentially hurts Boston more. "The DH, who bats in place of the pitcher, is only used in the American League and, in the World Series, in the American League park. David 'Big Papi' Ortiz filled that role admirably for the Sox in Games 1 and 2 in Boston - he hit a home run in each game. "With Boston needing his hot bat, and no designated hitter in St. Louis, presumably it means putting him at first base and benching usual first baseman Mike Napoli, who's also an important part of the Red Sox offense." Tonight's game is scheduled to start at 8:07 p.m. ET. The starting pitcher for the Cardinals will be Joe Kelly; for the Red Sox, it'll be Jake Peavey, who hasn't been a regular visitor to the batter's box since he left the San Diego Padres in 2009. A look at his stats shows that Peavey hit two home runs and delivered 45 sacrifice bunts in his eight seasons in the National League. We'll remind you that home-field advantage in the World Series is determined by which league wins the otherwise-meaningless mid-season All-Star Game. That allows a team to play two games at home before heading on the road for three games, and then finishing the best-of-seven series with two more games at home (if necessary). In recent years, the edge seems to have helped. After the National League won the All-Star Game in the three seasons from 2010 to 2012, N.L. teams went on to win the World Series all three times. But the American League won the All-Star Game this season — just as it did before the Red Sox won the World Series in 2004 and 2007. In this year's series, Boston won the first game, 8-1, before falling to St. Louis, 4-2, in the second. With three games on tap in St. Louis, Cardinals fans are hoping for a sweep at home to win their third title of the century. As St. Louis Post-Dispatch columnist Bernie Miklasz says, the Cardinals are 59-28 at Busch Stadium this season, and 26-6 at home since Aug. 11. And, he says, Busch is a pitcher's park that could help the Cards' pitchers hold the Red Sox' formidable lineup in check. "Ortiz did it for two games during Boston's sweep of St. Louis in the 2004 Fall Classic and for two more in his team's sweep of Colorado in '07. He didn't commit an error in either Series. Ortiz hit over .300 in both Series. 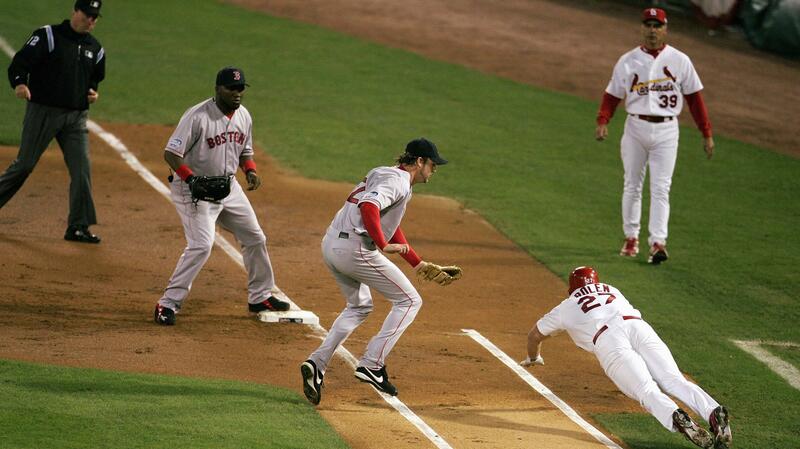 He even turned a nifty double play in Game 3 of the '04 Series, nailing Cardinals pitcher Jeff Suppan at third." Another uncertainty surrounding tonight's game is whether it will gain a large TV audience. Viewership of the 2013 World Series has "continued to trend toward record lows," reports Sports Media Watch. Thursday night's Game 2 drew a rating of 9.5, "the third-lowest overnight ever for Game 2 of the World Series," according to the site, which adds, " If the World Series is to average a double-digit final rating this year, a long series will likely be necessary."